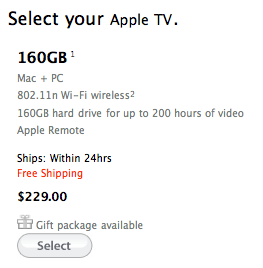 Apple has quietly dropped its 40GB model Apple TV, and reduced the price of its 160GB model from $329 to $229. Previously the 40GB model was priced at $229. The 160GB model is now the only Apple TV available. Apple TV hardware has remained unchanged since its introduction in March 2007. Many has expected Apple to upgrade Apple TV software to support the recently launched iTunes LP. With its lackluster sales, it is interesting to see how Apple plans to turn this product around.